For other uses of "Arctic Fox", see Arctic Fox (disambiguation). 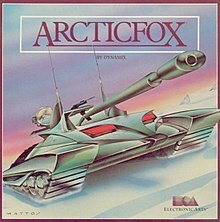 Arcticfox is a 1986 science fiction tank simulation video game developed by Dynamix and published by Electronic Arts. It was published in Europe by Ariolasoft. A sequel to Dynamix's Stellar 7, Arcticfox was developed for the Amiga as one of the platform's first titles but was quickly ported to other platforms including the Atari ST, Commodore 64, ZX Spectrum, MS-DOS and Apple II. A third game was released in the series in 1991 titled Nova 9: The Return of Gir Draxon. The game is set in a fictional 2005 where aliens have taken over Antarctica in an attempt to steal the Earth's oxygen. The player is sent to eradicate the intruders using a new super tank codenamed Arcticfox. Arcticfox's design team at Dynamix also went on to produce The Incredible Machine and Red Baron. The player must pilot the tank into enemy territory with the goal of knocking out the alien base. The player uses the tank's abilities to destroy the aliens' ships and equipment. The Arcticfox tank is equipped with a cannon, guided missiles and land mines, and is outfitted with radar, a GPS device, and fore and aft viewscreens. The player fights a variety of enemy units including planes, tanks, bunkers and communication towers. The vantage point for the game is the cockpit of the Arcticfox tank. The player can see out of the main viewscreen as well as the tank's sundry features such as the radar screen. The view also shows the character's hand on the joystick which moves in accordance with the tank's movements. Enemy targets are visible on the view screens and on radar. Computer Gaming World called Arcticfox "the first original new [EA game] that uses the distinctive features of the Amiga", calling the graphics and sound "Sensational!". It advised using a joystick instead of the mouse. In 1996, the magazine ranked the Amiga version of Arcticfox as the 138th best game of all time, calling it "the seminal 3D polygon-based shooter." Compute! also praised the Amiga version, and stated that the game would appeal to those who enjoyed both strategy and arcade action. Info magazine gave the Commodore 64 version four-plus stars out of five, praising its "great 3-D graphics", "intuitive control interface", and control over missiles. The staff of Crash magazine were critical of the ZX Spectrum version of the game, giving it an overall score of 41%. Skyfox (1984), EA's first game with the "fox" suffix. The sequel, Skyfox II, was developed by Dynamix. ^ Wagner, Roy (May 1986). "Amiga Preferences". Computer Gaming World. No. 28. p. 42. Retrieved 16 April 2016. ^ Stumpf, Robert J. (October 1986). "ArcticFox For Amiga". Compute!. No. 77. p. 64. Retrieved 9 November 2013. ^ "Arcticfox". Crash. No. 55. Newsfield Publications. August 1988. pp. 20–21. This page was last edited on 22 October 2018, at 11:56 (UTC).